Launched in 2013 by Foundations Chairman Mike McKendrick, the Firefighters Beyond Borders connects our Firefighters in Arizona with the Firefighting community in Israel to support one another in times of need. 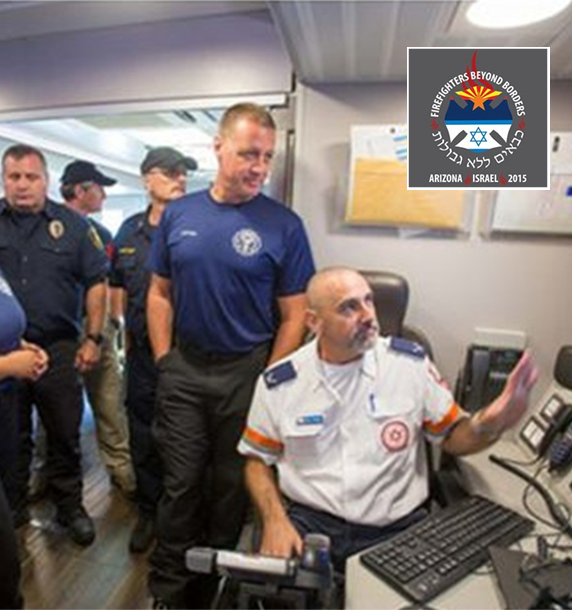 While the Firefighters in Israel and Arizona wear different badges and speak different languages, there is a unique connection that transcends the border and is shared by all First Responders. The new Firefighters Beyond Borders Fund will enable us to continue our support when needed. This past Thanksgiving Day 2016, when over 200 fires were burning across Israel, The Greater Tucson Fire Foundation Chairman and Retired Tucson Fire Department Assistant Chief Mike McKendrik received a call from Oshrat Barel, the director of the Tucson Weintraub Israel Center, requesting to contact the 747 Super water fighting tanker out of Marana, just north of Tucson. When the Carmel fires began to spread rapidly in 2016, The Fire Foundations moved into action, sending 5 of our firefighters to help fight the blaze. While we hope that a fire like the 2016 Carmel fire in Israel never happens again, we know that we need to be ready. Together, we can continue to build our resources and the Firefighters Beyond Borders program and be ready when help is needed. The 2017 Firefighters Beyond Borders program will include new planning guides and resource capacity building. Our vision is to be able to send an even greater number of firefighters next time an emergency occurs. Our Arizona Firefighters who had the opportunity to travel is Israel in 2016 are deeply grateful that they were able to meet the comrades in Israel and support a friend.